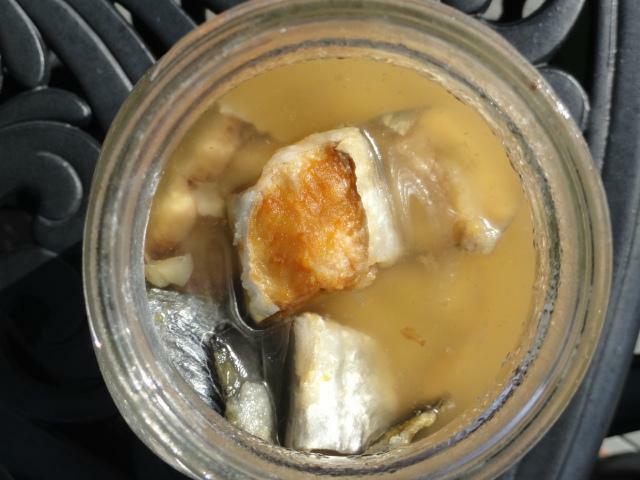 “Day 1, Tuesday (October 1, 2013) — I cut up the fish (Spanish Mackerel) into small pieces and arranged them inside the jar, pouring salt as I layer, and making sure to cover every piece with salt. 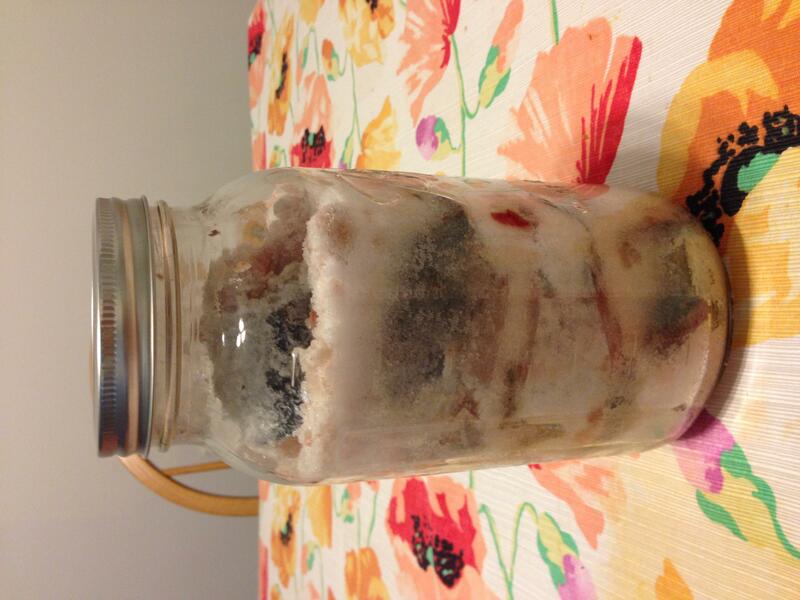 Day 2, Wednesday (October 2, 2013) –There seems to be a little bit of clear moisture / liquid accumulation at the top of the fish. The salt looks like it is starting to dissolve. There is no change in color in the cut-up fish. Day 11, Thursday (October 12, 2013) — The liquid accumulation looks about the same, maybe just a tad bit more. The salt is not fully dissolved at this point. 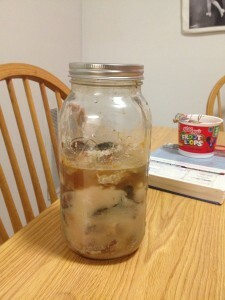 When I opened the jar, there is almost no smell to it except for a slight oily kind of smell. I also noticed a little oily residue accumulating on the top side of the jar as well as some floating on top. 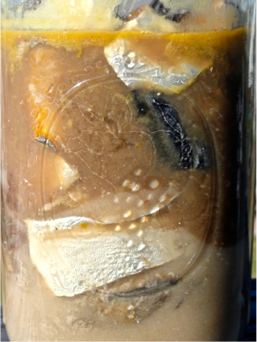 The process of making garum, so far, has not been as terrifying as I anticipated. I had some trouble initially cutting the fish, but once I got used to it, it was not as much trouble. It was interesting to watch the oil and water from the fish interact in the first few days of the process. The water initially collected at the bottom of the jar, possibly because I did not salt the first pieces of fish I placed in the jar as well as later pieces. However, the liquid migrated to sit on top of the salt and fish layers and the salt packed itself firmly at the bottom. The transition was more rapid than I expected. When I left my apartment one day the liquid was still at the bottom and when I returned it had moved toward the top. As the liquid at the top has become more opaque, the division of salt/fish and liquid layers has become more defined. The salt and fish have also condensed significantly. 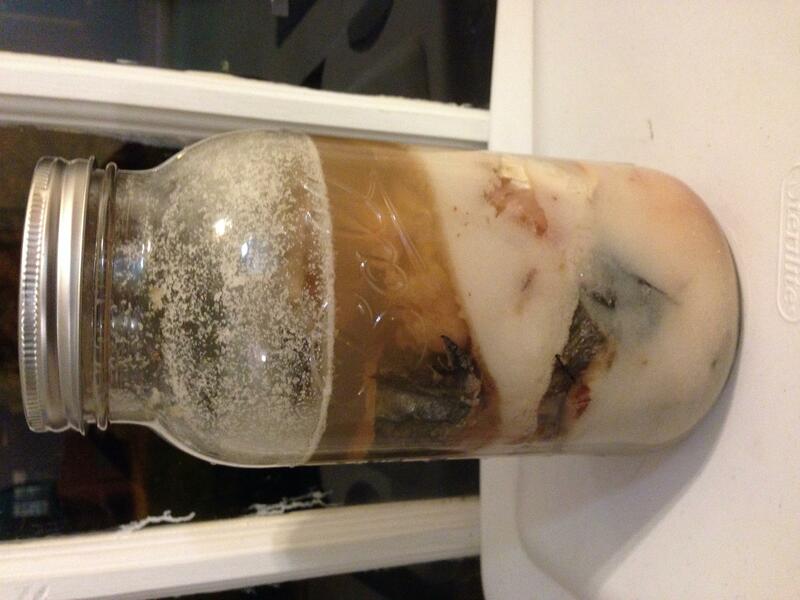 Originally, I filled the jar with fish to the shoulder of the jar, but it now occupies only about 60% of the space. I also noticed that the layering appeared different on the back side of the jar, so I rotated it to face the window. That solved the problem, so I am rotating the jar every few days to make sure each side gets equal amounts of sunlight. “October 1st – Amanda and I cut up our fish in my kitchen, much to the dismay of one of my roommates hovering in the background. I washed my fish for about 4 minutes, to ensure that there was no blood remaining in the gills. When it came time to cut the fish, my former vegetarian self was crying on the inside. I cut the head of the fish off, picking an area right behind the gills of the fish. To my horror (and my hovering roommate), some blood spurted out when cutting this area of the fish. The rest of the process was comparatively more pleasant as I cut the fish into pieces that would easily fit into the jar. I did not place the tail into the jar, but I did include all of the internal organs and the head of the fish. I rolled each piece in salt before placing it into the jar, and spread a layer of salt over the pieces every so often. 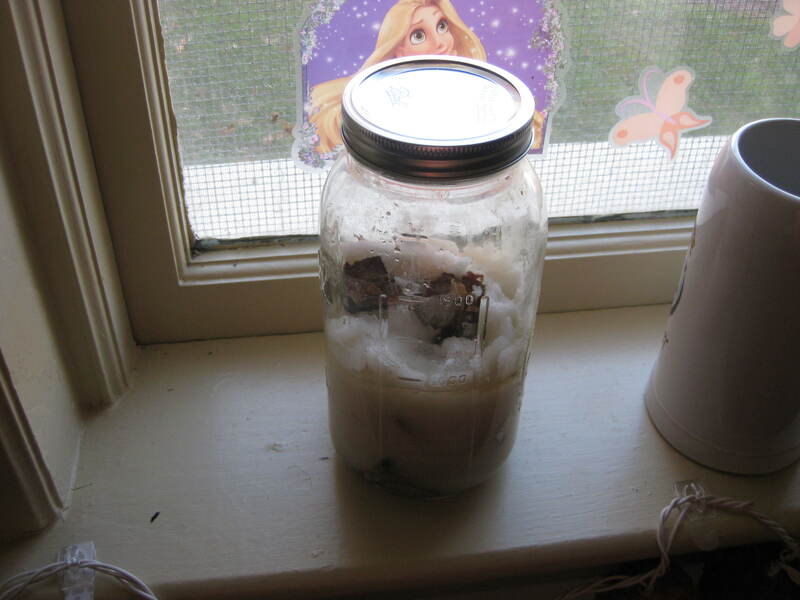 When I was done, I sealed the jar tightly and put it near the window so that it would receive some sunlight. 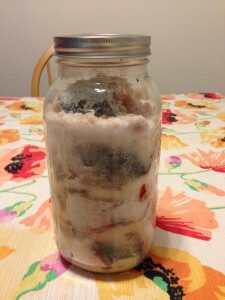 October 8th – I was apprehensive about opening the jar, as I was convinced that there was going to be an awful smell emitting from it. I was pleasantly surprised, however, to find that the smell was not anything close to what I expected. It was more salty than anything else, with a very slight trace of fish. Some amber-brown liquid that was appearing in my jar due to the remaining blood in the fish. 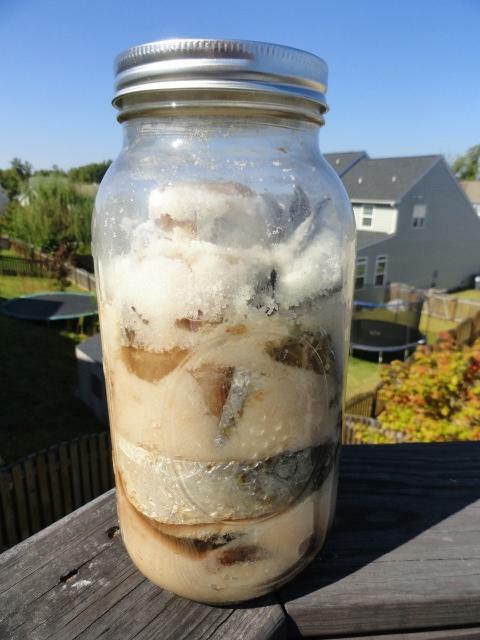 The volume of the substance in the jar compacted dramatically within the first week, I assume due to the salt being absorbed. October 15th – I was pleased to find that the smell was still not as overwhelming as I expected. It was still very salty, and a lot more liquid had cumulated since my last check. The salt was beginning to have a sort of matted appearance, with lumps of salt remaining as the rest succumbed to the liquid. October 22nd – The colored liquid has begun to stain some of the salt, confirming my suspicious that the blood was responsible for the amber hue. I was a little worried about how much liquid was beginning to appear in the jar, as most of the bottom layers were completely compressed by liquid. I am beginning to smell a bit more of the fish, but it really smells like walking past the fish section of the grocery store. No rancidness has appeared thus far. 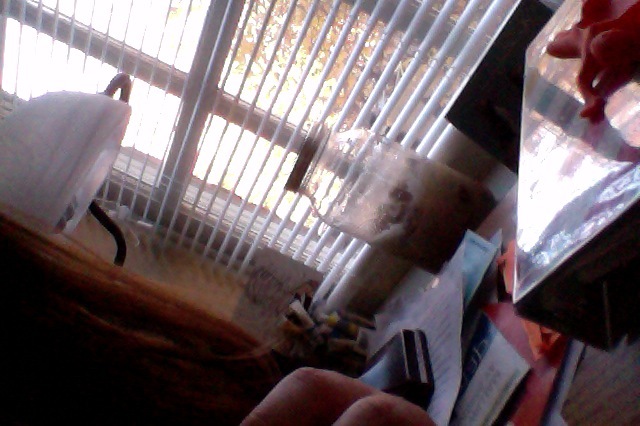 October 29th – I did not do any updates this week, I had too many assignments and midterms to distract me. November 5th – Not much of the salt is breaking down, which is beginning to make me suspect that I added too much salt to the mixture. Besides a few spots of salt near the top, most of the salt on the bottom layers has compressed even more, completely surrounded by liquid. I have noticed that the liquid is becoming a deeper amber-brown. The eye of the fish is starting to attract more of the salt, which I found to be a bit intriguing. I am not sure what this would mean, but I will keep an eye (I realize the horrible pun) on it in the coming weeks. By November, the “amber colored liquid” was visible in most jars, but in different quantities. “Day 44, Thursday (November 14, 2013) — We get to stir the contents today. Exciting! 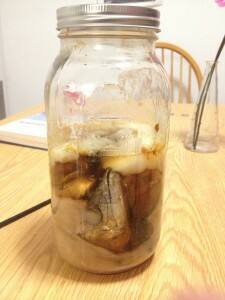 After opening the jar and stirring the sauce, I noticed that the fish parts looked and felt a little tough and hardened. I guess it is what I should have expected after they have been marinating or curing in salt for weeks now. However, I actually thought the fish parts would be softer and easy to crush. My guess was wrong. The sauce looks thicker and somewhat ‘mucky-looking,’ and the smell is very fishy, and reminds me of the fermented baby shrimp we call “Bagoong” that we have in the Philippines. Bagoong smells just as bad as a fish sauce, but it is supposed to make some dishes taste better too, just like the fish sauce. 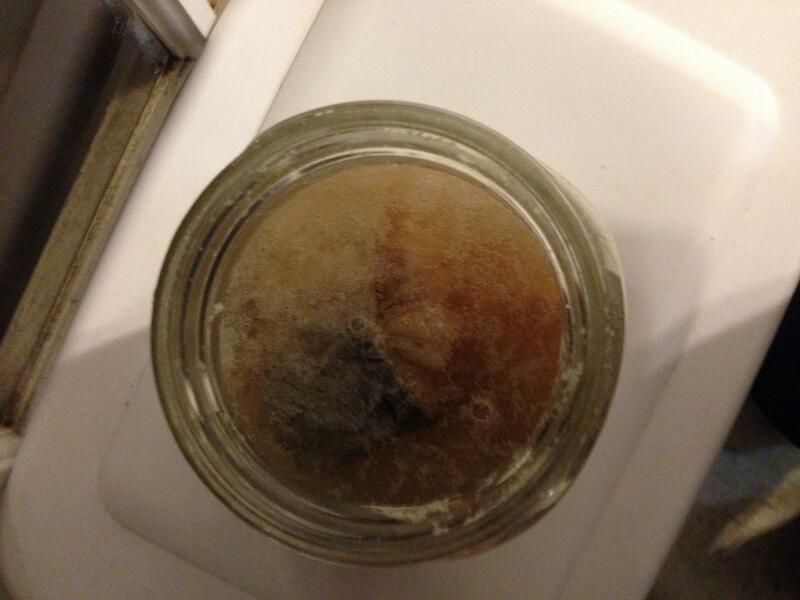 I tried to mix the fatty substance that is sticking on the side of the jar with the fish sauce. The salt, I observed, seems to be staying at the bottom, even though I worked hard at mixing everything. 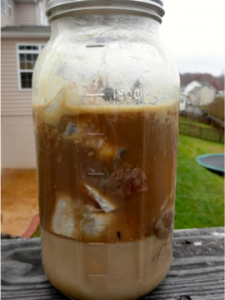 Day 47, Sunday (November 17, 2013) — Three days after stirring the contents, I noticed that the Garum sauce seems to have ‘stratified’ and settled into layers. Beginning at the bottom with the whitish color of dissolved salt, the second and third layers seem to have changed in two different colors and consistency. The second with a thick and muddy color, and the third with more of a transparent brown/amber color. 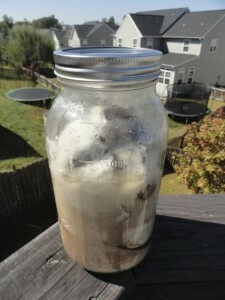 Additionally, the fatty substance is back on the top and side of the jar. Day 55, Monday (November 25, 2013) — I stirred the sauce again today and it looks muddy again. The salt have not dissolved completely. I am not sure, at this point, if it ever will. By the time we ended the experiment in the second week of December, the process in some jars was certainly yielding garum, while others needed more time. Each student had guidelines for the ratio of salt to fish, but naturally, all five jars received slightly different amounts of salt vs fish, as well as different amounts/quality of sunlight, so the results were not uniform. Some students decided to give the process more time and continue the experiment on their own. 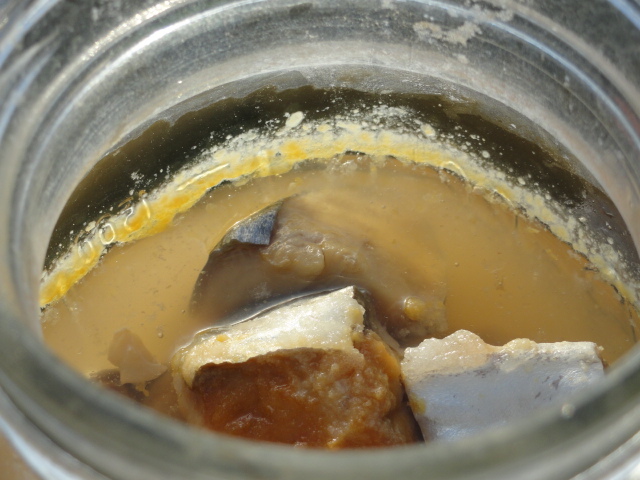 The jars that had clearly produced the garum were carefully observed by the group for smell, consistency, and look. 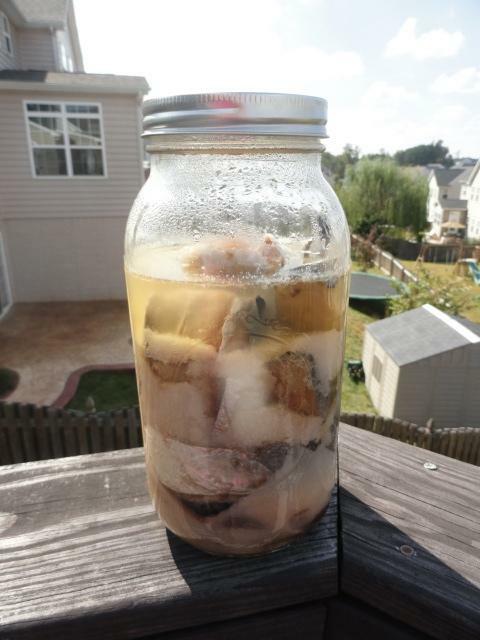 We strained the liquid several times and ended up with the clear amber colored, mildly “fishy” smelling garum. In all cases, the result was precisely as predicted by the Apicius recipe, as well as most other ancient recipes. 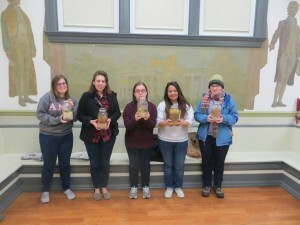 Good luck with the garum, Amanda, Margaret, Karen, Niela, and Joanna! * Finding Atlantic mackerel, which would have been more authentic, was surprisingly difficult. Atlantic mackerel is one of the most abundant fish in the Atlantic (and Mediterranean; Apicius specifies mackerel as one of the most popular fish in making garum), but no fish markets in the Virginia, DC, Maryland area had any, even though they had plenty of Spanish and King mackerel. One fisherman’s response for this situation was the low demand and low price for Atlantic mackerel, compared to the other two. This entry was posted in Uncategorized on January 11, 2014 by acorlu.